SINGAPORE – December 11, 2012 – “Where can I go for $200 this weekend?” Flocations Pte. Ltd., a popular online travel discovery tool, helping travelers answer that question, closed a pre-series round of funding, raising SGD 700,000 led by TNF Ventures. 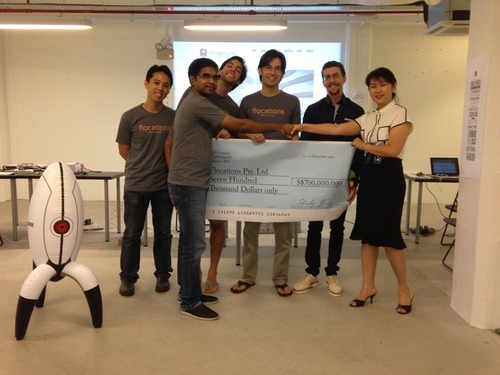 The investment is supported with additional capital from SingTel Innov8 and Singapore-based business angel Ben T Ball. Flocations.com finds getaways and short-haul breaks for travelers in Southeast Asia, in a fun and interactive way. Flocations.com presents users with an interactive map comparing travel options based on price rather than the traditional date and destination. The funding allows Flocations.com to offer a new set of innovative features, integrating both hotel and flights into their search by price methodology. Flocations graduated among the first batch of 11 start-up companies from the JFDI-Innov8 2012 Bootcamp earlier this year. It was one of two companies to be earmarked for investment by SingTel Innov8 immediately following the bootcamp demo day. Flocations Pte Ltd incorporated in February 2012 in Singapore, where its operations are based. The company’s four founders are multinational, hailing from Canada, India, France and Singapore. For the first time, their online travel service Flocations.com makes search-by-price for getaways and short-haul destinations across South East Asia fun, visual and interactive. TNF Ventures (TNFV), an incubator under National Research Foundation’s Technology Incubator Scheme. TNF Ventures, founded by key shareholders with backgrounds of entrepreneurs, senior corporate executives and venture capitalists are some of the IT luminaries in Singapore. With the belief that their combined knowledge, experience and contacts could make a huge difference to a burgeoning startup ecosystem, TNFV looks to contribute back to Singapore by incubating the next generation of entrepreneurs. SingTel Innov8 (Innov8), a wholly-owned subsidiary of the SingTel Group, is a corporate venture capital fund, with its own set of decision making, approval and funding processes. It has an initial fund size of S$200 million. Innov8 focuses its investments on technologies and solutions that lead to quantum changes in network capabilities, next generation devices, digital content services and enablers to enhance customer experience. It works closely with the ecosystem of leading innovators, developers, government agencies, R&D and capital providers to bring cutting-edge technologies and solutions to the various markets the SingTel Group operates in. This entry was posted in Travel Agency, Uncategorized and tagged Fund Raising, SingTel Innov8, TNF Ventures on December 11, 2012 by Flocations.